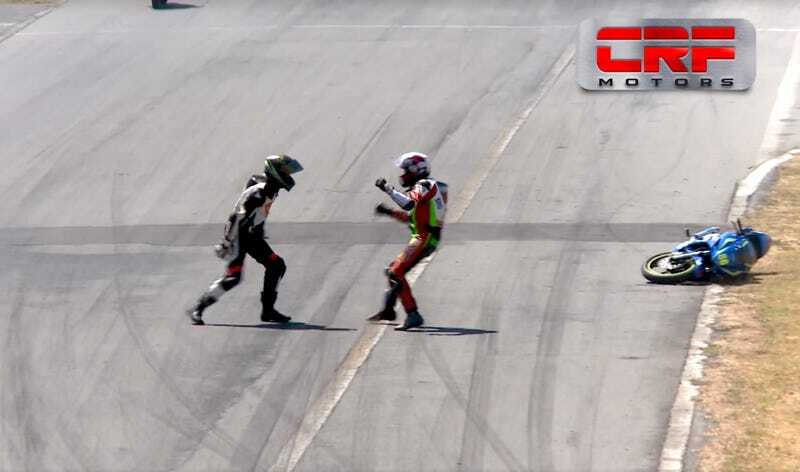 This unintentional piece of slapstick comes from last month’s Costa Rica National Motorbike Championships. Riders Jorge Martinez and Marion Calvo were jockeying for position during the race when Martinez lost control of his bike. Somehow, he ended up joining Calvo, who pulled over and was just as infuriated. The two then took turns punching each other, with Martinez knocking Calvo off his bike. Though the original clip is a month old, it resurfaced today because of the punishments handed down this week. The Latin American branch of the International Motorcycle Federation suspended both Calvo and Martinez for two years.